High quality, professional handheld butane gas blow torch. Suitable for brazing, heat-shrinking, model making, silver soldering. 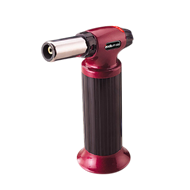 Features both gas feed and air volume adjustments, providing the flexibility to adjust the flame. All aluminium construction.